New York-based PAC spends dollars to sway another local election | Audio and video stories from Southwest Washington. A labor union that is headquartered in New York and represents U.S. and Canadian hospitality workers would like to influence Vancouver voters to choose Anne McEnerny-Ogle for City Council. Washington State’s Public Disclosure Commission (PDC) shows that a political action committee for the labor union UNITE HERE spent more than $32,000 on a political postcard for Anne McEnerny-Ogle. McEnerny-Ogle is opposing Bill Turlay for Vancouver City Council Position No. 6. Politcal action committees (PAC) are required to file regular reports disclosing their disbursements and this one was filed Oct. 20, within two days of the piece being mailed by an out-of-area printer in Sacramento. 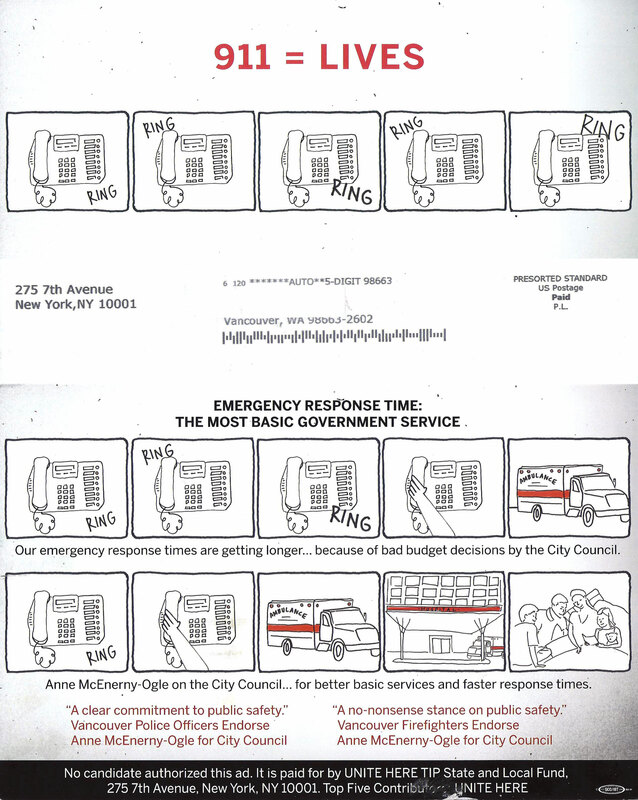 The large postcard carries the headline, “911 = LIVES.” This appears over a hand-drawn storyboard that shows a ringing phone that goes unanswered. 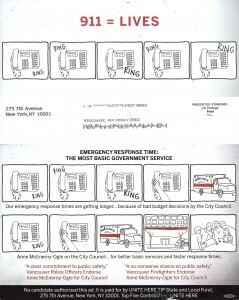 On the flip side of the mailer the illustration shows a phone answered in half the time, and additional panels show an ambulance arriving at the hospital. The text reads, “Our emergency response times are getting longer…because of bad budget decisions by the City Council.” Endorsements by the Vancouver Police Officers and Vancouver Firefighters are noted, neither of which drive ambulances. UNITE HERE’s ties to the community are embedded in the hospitality industry. They represent workers at the Hilton Vancouver who are currently negotiating a new contract. Negotiations broke down earlier this month when the workers asked for a 53 percent increase in wages and benefits. East County Citizens for Responsible Government, a Clark County PAC representing businesses and organizations in Camas and Washougal, sent out a press release in response to the UNITE HERE funded mail drop. Turlay poses what he feels is the basic question that has to be answered, “Why would New York send this kind of money to a City Council race unless there was some advantage?” Listen to Bill Turlay’s audio interview at the top of this article. Elizabeth Pike says, “This is not the first time UNITE HERE has invested in Vancouver politics.” The New York PAC’s rolodex includes Tim Leavitt, whose mayoral campaign received $55,000 from UNITE HERE. Pike’s east Clark County PAC works closer to home. She describes her PAC as local people who want to have a positive impact in local elections. They funded an independent expenditure for “a low tax, small government, conservative candidate,” Neil Cahoon, who’s running for Port of Camas-Washougal commissioner against incumbent Bill Ward. The other expense for East County Citizens for Responsible Government was a newspaper ad in a small paper for write-in candidate Steve Bang, who is running against Linda Dietzman for Washougal City Council. Dietzman also serves on the C-Tran board. COUV.COM continues to research this story and has contacted UNITE HERE for their comment.